I keep escaping the dire boxes. Dodge County, GA told mobile home residents to evacuate to permanent structures and several counties in central GA have issued curfews. Incredible how little Michael has weakened. Oh no. The blue dot is my dad's office (where three of our cats are). I hope it dissipates before it reaches town. Fort Valley has about 10,000 residents. It's in a pretty rural area currently. It looked like it passed south and west of downtown, but that might mean it passed over Fort Valley State University. Sorry to be filling the thread with tornado talk hundreds of miles inland but this was (literally) really close to home. This would be the second hurricane where his office just dodged a tornado. An F2 missed him by about a third of a mile during Katrina and peeled off a few of his shingles. Winds are down to 140 mph, still a dangerous Cat 4. Moving NNE towards the I-10 corridor. * Until 430 PM EDT. near Roberta, moving northwest at 40 mph. An extreme wind warning is in effect for areas around Marianna, Florida and Bainbridge, Georgia. Tornado warning out well away from the center near Gainesville, Florida. This thing isn't dying ....and um, is it moving due North? 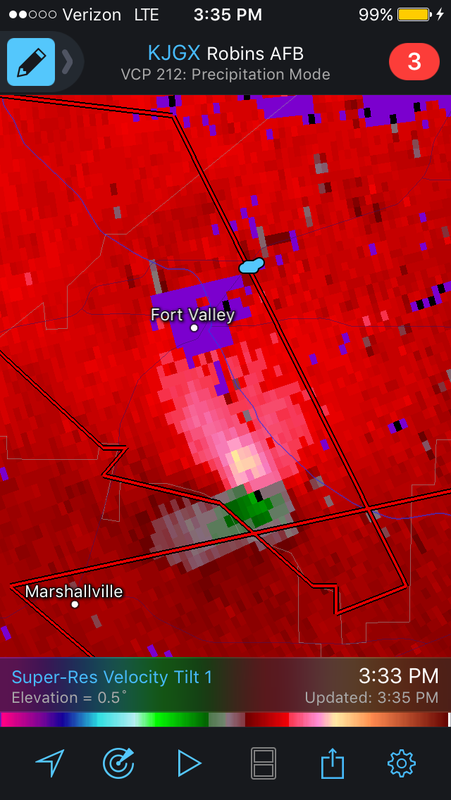 That's the same cell that produced a tornado near Fort Valley (Peach County). No confirmed damage yet but a couple of photos that show an apparent TOG and there was a TDS. KTLH and KEOX are both offline. Eye of the hurricane about to enter Houston County, Alabama. I cannot believe it's still a Cat 3 after being inland for so long! Down to 125 mph and forward speed is up to 16 mph. After seeing that harrowing footage, Brett and Stephen are okay per Brett’s wife. What a relief! We've definitely got to have a better way to rate and classify hurricanes than the Saffir Simpson scale. Please understand that there is catastrophic damage in places. This was an incredibly dangerous storm and there are areas that will take months/years to recover. But, NWS Tallahassee is reporting a preliminary max surge/inundation of 6-8ft with another 1-2ft possible. While the wind damage pictures are gruesome, they certainly don't look like Homestead after Andrew. Remember the integrated kinetic energy that we all talked about for Florence? It likely maxxed out around 50TJ. I'm not attempting to downplay Michael whatsoever. By the Saffir Simpson scale he very well likely did reach Category 5 strength. But, I think we'll find the total damage he produced (wind and surge) to be less than Katrina, Ivan, Ike, etc. I think measuring the potential kinetic energy gives us a better understanding of the overall damage producing capability than the Saffir Simpson scale does. Perhaps we'll eventually hear of surge over 12ft, but the SLOSH model predicted a lot higher surge for a Cat 4/5 than what has been reported so far. I think Michael's relatively compact size prevented the kind of damage we'd normally associate with a high-end Cat 4 or a Cat 5. I know this storm is still fresh and its impacts are still ongoing. I don't mean to minimize the impact of Michael whatsoever. I have family directly impacted by Michael that were only about 10-15nm from landfall. But I think this merits discussion. I'm sure we've yet to see the worst damage or the overall scale of it. I'm glad Michael wasn't a much larger storm because if he had been we'd be looking at catastrophic damage on a much broader scale. Perhaps his compact size is also what allowed him to continue to intensify. The eventual academic research on Michael and this subject will be very interesting. Edited to add: Michael's accelerating forward speed might've played a role in this as well.